Thank you, Takeuchi-san. It is a pleasure to reconnect with you here in Tokyo and an honor to have the opportunity to speak before this distinguished audience. The Federal Reserve (the Fed) has a somewhat more complex organizational and governance structure than most other central banks around the world, so before discussing recent developments in the implementation of monetary policy, I’d like to take a moment to describe roles and responsibilities within the Federal Reserve System and where the Desk fits in. Formulating policy in pursuit of that dual mandate is the province of two separate-but-related policymaking entities within the Federal Reserve System (the System)—the Board of Governors of the Federal Reserve System (the Board of Governors) and the FOMC (which I also refer to as “the Committee”)—each of which has responsibility for certain policy tools. The FOMC is the principal body for monetary policymaking and consists of the seven members of the Board of Governors plus the presidents of the twelve Federal Reserve Banks (only five of whom are voting members in any given year). The FOMC is responsible for the use of open market operations (OMOs), which are purchases and sales of securities in the open market for the System Open Market Account (SOMA), the Fed’s securities portfolio. OMOs are traditionally the primary tool through which monetary policy is implemented. The Board of Governors is responsible for several complementary policy tools. These tools pertain largely to depository institutions (DIs or “banks”) and include the discount rate—that is, the rate at which banks borrow from the discount window, the Fed’s lending facility administered through the twelve regional Federal Reserve Banks—and policies around reserves held by depository institutions at the Fed (including reserve requirements, and more recently, the payment of interest on reserve balances and term deposits).2 However, it’s important to note that each of these tools is merely a means to an end, used to influence financial conditions in order to achieve the Federal Reserve’s dual mandate. Since 1936, the New York Fed has been selected each year by the FOMC as the Bank within the System responsible for the execution of OMOs. Within the New York Fed, the Desk, under the guidance of a manager of the SOMA selected by the FOMC—currently me—is responsible for conducting open market operations under the authorization and direction of the FOMC.3 In practice, the FOMC’s operating objective for OMOs—for example, a target rate for overnight interest rates or a specified amount of assets to purchase—is communicated to the Desk through a policy “directive” that the Committee votes on at the conclusion of each meeting. This directive specifically instructs the Desk to conduct transactions for the SOMA in furtherance of the desired operating objective. In recent years, like many other central banks around the world in the face of the Great Recession and the prolonged economic recovery that has followed, the Fed adopted unconventional measures to provide monetary policy accommodation in pursuit of its macroeconomic policy objectives. This is reflected in changes in the Fed’s operating framework and the FOMC’s operating objective for OMOs. For many decades prior to the crisis, the operating objective for OMOs was expressed as a target for the federal funds rate—an overnight, unsecured rate in the market for reserve balances. The target rate was achieved through permanent and temporary OMOs that sought to adjust the supply of reserve balances in the banking system to a level that was expected to equal the estimated level of demand for reserve balances at the FOMC’s target rate. The Desk’s permanent additions to the supply of reserve balances were designed to fall somewhat short of the total demand, creating a “structural deficiency” in the supply of reserves. The Desk then conducted daily fine-tuning operations to temporarily add reserve balances to get to the desired level. These daily operations represented a marginal adjustment to the aggregate supply of reserves, largely in response to the exogenous impact of transitory changes in other Fed liabilities such as currency in circulation and the level of the U.S. Treasury’s account balance at the Fed. Minor variations in the total level of reserves supplied could move equilibrium market rates up or down as individual depository institutions with a deficiency of reserves had to find and trade with depository institutions with a surplus of reserves. This system functioned with a relatively low level of reserve balances.4 The Desk was able to reliably achieve the FOMC’s policy directive under this implementation framework. The effective federal funds rate—the average rate prevailing in the brokered federal funds market each day—routinely hit the FOMC’s target rate, generating a high degree of confidence among market participants in the Desk’s ability to implement policy. Importantly, in October 2008, the Fed was granted authority to pay interest on depository institutions’ reserve balances.6 In an environment of elevated reserve balances that resulted from the Fed’s asset purchases, the payment of interest on excess reserves (IOER)—currently at a rate of ¼ percent—has kept the overnight federal funds rate within its target range (Figure 2).7 Although the FOMC continues to direct the Desk to undertake OMOs as necessary to maintain conditions in reserve markets consistent with federal funds trading in a range from zero to ¼ percent, the Desk has not needed to conduct OMOs to manage the supply of reserves since December 2008. The FOMC’s different objective for OMOs reflects the primary transmission channel through which LSAPs are understood to affect financial and economic conditions. Central bank purchases of longer-term bonds reduce the stock of such securities held by private investors. Accordingly, the purchases remove duration risk—and in the case of agency MBS, prepayment risk—from the private sector, which drives term and other risk premiums on those assets lower than they would otherwise be.11 This re-pricing of risk ultimately puts downward pressure on long-term interest rates, an effect that spreads to other assets as some investors rebalance their portfolios. The term premium effect of the Fed’s purchases should continue to influence financial conditions as long as the assets remain in the SOMA portfolio, although the size of the effect will diminish over time as the risk associated with the portfolio diminishes. Some standard portfolio risk measures illustrate the degree to which the Federal Reserve has absorbed extra duration risk onto its balance sheet. 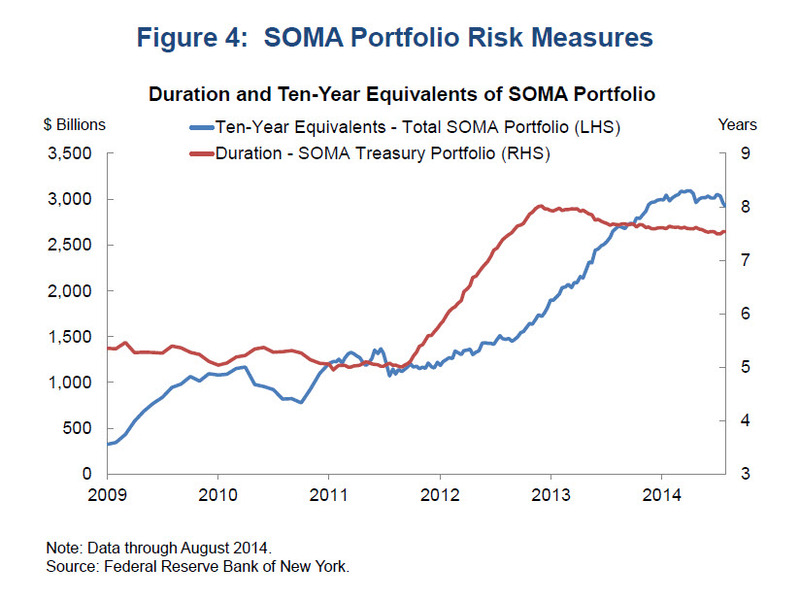 The SOMA Treasury portfolio currently has an average duration of about 7.5 years, compared with a pre-crisis level of about 2.6 years. Meanwhile, the duration risk of the entire domestic securities portfolio, including agency MBS and agency debt as well as Treasury securities, is equivalent to about $2.9 trillion in 10-year Treasury securities (Figure 4). Purchases likely also work through a signaling effect, to the extent that they are perceived as a credible signal of the central bank’s intentions regarding the future level of short-term interest rates. And in circumstances when market functioning is unusually strained, as was the case prior to the Fed’s first LSAP program, asset purchases may enhance liquidity through the central bank’s consistent and significant presence in the market. Over the past six years, the FOMC has been flexible in using these tools, adapting as it learned and as individual circumstances changed. In the first two LSAP programs and MEP, for example, the FOMC communicated an expected total size and completion date for each program. However, the third (and current) LSAP program has been outcome-based, with the FOMC announcing only a monthly pace and composition for its purchases and noting that purchases would continue until there is a substantial improvement in the outlook for the labor market in a context of price stability. Other central banks have also used conditional asset purchases effectively. Perhaps the best example is the Outright Monetary Transactions program announced by the European Central Bank (ECB) in September 2012. This program is credited with helping to stabilize euro-area fixed income markets by ruling out certain bad equilibria. This success was achieved without the purchase of a single asset. Another example of conditional asset purchases is the BoJ’s statement of a commitment to continue QEP until inflation registered stably at or above zero. So where are we now? The current purchase program appears to be nearing its completion. Last week, the FOMC directed the Desk to reduce purchases of Treasury securities to $10 billion per month and purchases of agency MBS to $5 billion per month starting in October. The Committee also indicated that it will end the current purchase program at its next meeting if incoming information broadly supports its expectation of ongoing improvement in labor market conditions and inflation moving back toward its longer-run objective. It also directed the Desk to maintain its agency MBS and Treasury security reinvestment policies—activities it separately announced it expects to continue after it begins to increase its target range for the federal funds rate. Should this course come to pass, the domestic securities portfolio will peak at a par value of about $4.2 trillion—more than a five-fold increase since the start of the financial crisis in August 2007. The composition of the portfolio will also remain more complex. Formerly composed entirely of Treasury securities, the domestic portfolio is now only 60 percent Treasury securities, with the remainder held in agency MBS (and a small amount of agency debt securities). As I noted earlier, the weighted average maturity of the Treasury portfolio has lengthened substantially, while the MEP essentially eliminated the portfolio’s holdings of any Treasury securities maturing prior to February 2016. Meanwhile, it’s hard to predict the exact pace at which the SOMA portfolio’s agency MBS holdings will pay down over time given the prepayment uncertainty associated with those securities. At last week’s meeting, the FOMC also reaffirmed its view that it likely will be appropriate to maintain the current zero to ¼ percent target range for the federal funds rate for a considerable time after the asset purchase program ends, especially if projected inflation continues to run below the Committee’s 2 percent longer-run goal, and provided that longer-term inflation expectations remain well anchored. Meanwhile, as a matter of prudent planning, the Committee has been deliberating how it should proceed to remove policy accommodation (often called “normalization”), when it believes the appropriate time to do so comes. Although the specific timing of this is not yet known, it’s certain that the level of reserve balances in the banking system will be very high. Assuming no other liabilities are issued, there would be about $2.9 trillion in reserves—mostly in excess reserves—if the Committee ends asset purchases next month and continues reinvestments. In itself, an elevated level of reserve balances need not impede the FOMC’s ability to effectively raise the level of short-term interest rates because of the ability to pay interest on excess reserves. Following last week’s FOMC meeting, the Committee released a revised set of normalization principles and plans (taking into account changes in the SOMA portfolio and enhancements in available tools since it originally issued such principles in June 2011) that it intends to implement when it becomes appropriate to begin normalizing the stance of monetary policy. Importantly, as the Chair noted during her post-meeting press conference, this statement is intended to provide information to the public about the eventual normalization process; it does not signal a change in the current or future stance of monetary policy. According to the principles, the Committee will adjust the level of monetary accommodation primarily by utilizing policy tools to influence the level of short-term interest rates—in the first instance, using tools with rates directly administered by the Fed. Tools that can immobilize or drain large levels of reserves to tighten control over the federal funds rate also remain available. However, the principles do not envision that active adjustments to the SOMA portfolio will play a featured role. Specifically, the FOMC indicated that the federal funds rate will continue to play a central role in the Fed’s operating framework and communications during normalization, and that it will raise the target range for the federal funds rate when economic conditions warrant a less accommodative monetary policy stance. 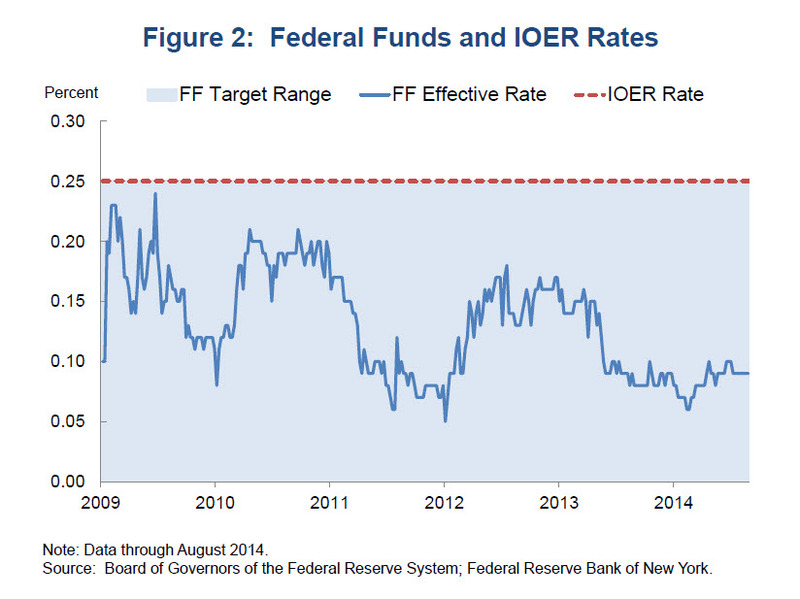 Adjustments in the interest rate that the Fed pays to depository institutions on excess reserve balances—that is, the IOER rate—will be the primary tool to move the federal funds rate into the target range. Raising the IOER rate should put upward pressure on a range of market interest rates and influence overall financial conditions in a way that fosters the Federal Reserve’s macroeconomic objectives. The Committee expects to gradually return the balance sheet to a more normal size and composition, primarily by ceasing to reinvest repayments of principal. A halt or reduction in reinvestments is expected to occur after the FOMC begins increasing the target range for the federal funds rate. The FOMC does not plan to use asset sales as part of the normalization process, but suggests that limited sales might be warranted in the longer run to reduce or eliminate residual agency MBS holdings. The Federal Reserve will continue to test some of these tools to gather additional information about their efficacy and to enhance their operational readiness prior to liftoff. For the past year, the Desk has been conducting an exercise of ON RRP operations. Conducting ON RRPs for same-day settlement with a broad range of counterparties—including primary dealers, money funds, government-sponsored enterprises, and banks—allows the Federal Reserve to provide a safe, liquid investment to a wider range of money market participants than those able to earn IOER, and thus expands the universe of counterparties that should generally be unwilling to lend at rates below those available through the Federal Reserve. The increased competition that the availability of this instrument provides should help to firm the floor on the level of short-term interest rates—that is, the rate beneath which market participants should theoretically be unwilling to lend funds. Indeed, ON RRP exercise results over the first year suggest that the operations have been successful working with IOER in establishing a floor on the level of key money market rates (Figure 5). All of the Desk’s eligible counterparty types participate in the ON RRPs, with money funds accounting for the largest share of take-up (Figure 6). Take-up at the operations generally increases when the spread between market rates and the ON RRP offered rate narrows. Take-up also rises substantially around quarter- and year-end financial reporting dates, when some money market participants’ access to other overnight secured investments is more limited. 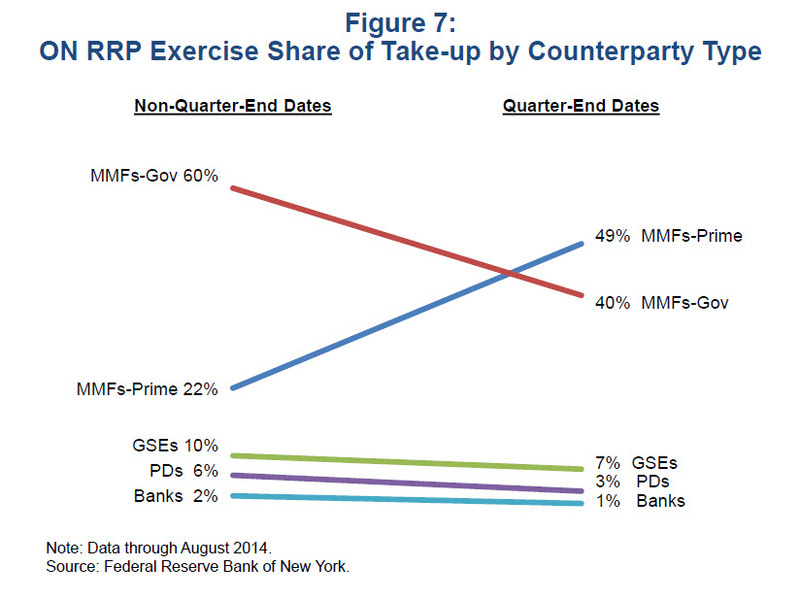 The increase in take-up on these dates is especially large for prime money market funds (Figure 7). In addition to patterns of usage of the ON RRPs themselves, we also analyze trading patterns and interest rate dynamics in secured and unsecured funding markets. In doing so, we use a wide range of data, including transactions data for unsecured funding markets obtained through a new Federal Reserve collection effort (FR 2420). 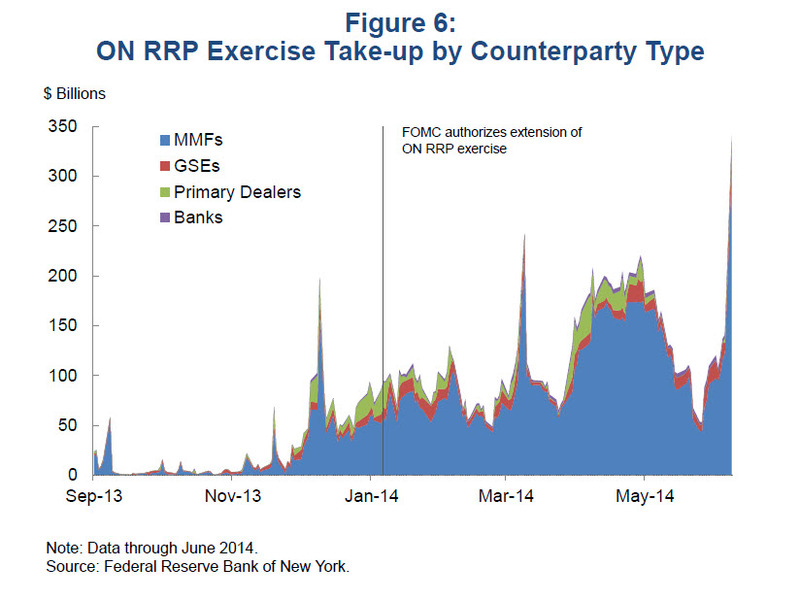 While ON RRPs are a powerful tool for policy implementation, FOMC and market participants have noted the potential for very large regular usage to alter patterns of financial intermediation or, in a fixed-rate structure with no take-up limits, to exacerbate liquidity pressures during times of stress. To further examine how ON RRPs might best be structured to supplement IOER in the control of the federal funds rate while limiting the potential for unintended effects in financial markets, the FOMC has directed the Desk to test several changes to the design of its ON RRP operations. As of Monday, the per-counterparty maximum bid limit was raised from $10 billion to $30 billion, and an overall size limit of $300 billion was imposed for each operation. If the total amount of bids received in an operation is less than or equal to the $300 billion size limit, awards will be made at a fixed offering rate. However, if the total amount of bids received exceeds the overall operation size limit, the $300 billion in ON RRPs will be allocated through a single-price auction using interest rates that counterparties now include with their bids. Awards are made at a “stopout rate”—the rate at which the overall size limit is achieved—with all bids below this rate awarded in full and all bids at this rate awarded on a pro rata basis. The stopout rate is determined by evaluating all bids in ascending order by submitted rate up to the point at which the total quantity of offers equals the overall size limit.13 The Federal Reserve will be closely analyzing the results of the ON RRP exercise conducted under these new testing parameters in order to further its understanding of how an ON RRP facility might best be structured during the initial stages of the normalization process. In addition, the Federal Reserve Board has been testing a facility through which it offers term deposits to credentialed depository institutions. 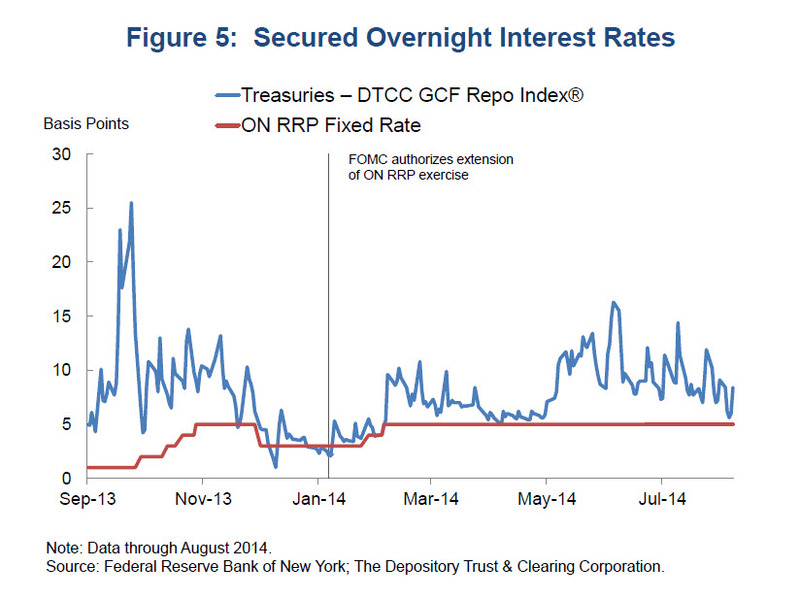 Term Deposit Facility (TDF) transactions could be used to temporarily reduce the quantity of reserve balances. An eight-week series of tests this summer explored how demand for term deposits responds to variations in the maximum award limits and rates. Higher offered rates attracted greater use, both in terms of the number of participants and the total dollar volume demanded. Demand for the TDF may have been tempered somewhat by the instruments’ lack of an early-withdrawal feature, and thus the inability to consider them as high-quality liquid assets for regulatory purposes. The next round of TDF testing, which will commence in October, will incorporate an early withdrawal feature, as well as gradually increase the maximum award amount and rate. I’ve discussed how the FOMC’s eventual approach to removing monetary policy accommodation reflects developments in the Federal Reserve’s balance sheet since the onset of the financial crisis. 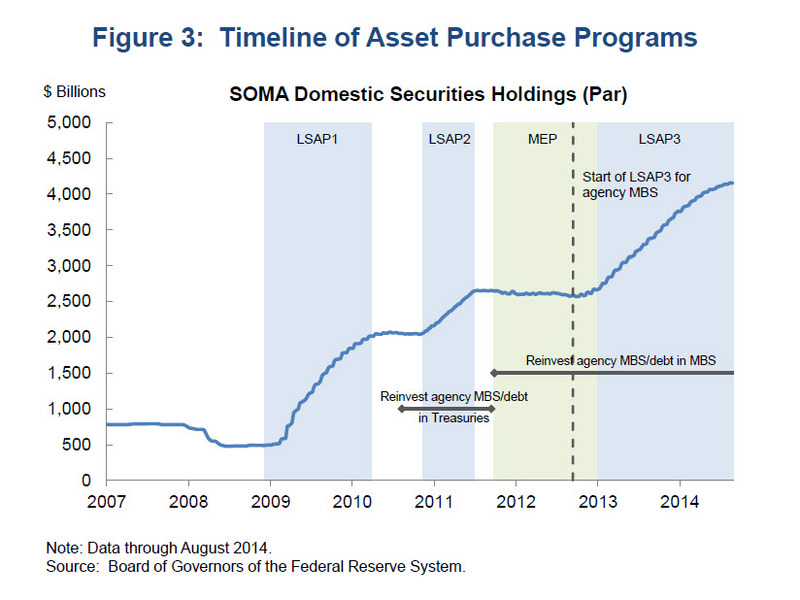 As noted earlier, the relatively long maturity structure of the SOMA portfolio means that the level of reserve balances in the U.S. banking system will decline only slowly through passive means, absent any asset sales. Other central banks that have undertaken unconventional measures also face (or will eventually face) similar challenges when they deem it appropriate to begin their own policy normalizations. The Bank of England (BoE) and the Bank of Japan are two relevant examples that come immediately to mind. The BoE’s Asset Purchase Facility, through which its Monetary Policy Committee (MPC) purchased £375 billion of longer-term assets between 2009 and 2012, was quite comparable in purpose and design to the Fed’s LSAP programs. Moreover, since March 2013, the BoE has reinvested the cash flows associated with maturing gilts in the facility in order to maintain the stock of securities at a steady level. In its February 2014 Inflation Report, the MPC provided guidance on its expected normalization framework, laying out an approach in which its Bank Rate—the deposit rate for central bank reserves in the U.K.—is the active marginal instrument for monetary policy while portfolio-related tools, including reinvestments and asset sales, receive less emphasis. Specifically, the MPC suggested that it intends to maintain its stock of purchased assets, including reinvesting the cash flows associated with maturing securities, at least until it raises its target short-term interest rate from its current level. Meanwhile, the BoJ is still purchasing assets under QQE, which it launched in April 2013. With a goal of increasing its Japanese government bond (JGB) holdings by ¥50 trillion per year, it has not yet initiated a discussion of eventual normalization. When that time comes, however, the BoJ will be holding a large portfolio of longer-term JGBs. The BoJ’s balance sheet will therefore look markedly different than it did when the QEP ended in 2006, at which time the BoJ just allowed short-term funds-supplying operations to roll off. The portfolio size and composition to which each central bank eventually normalizes will, of course, depend on what it eventually determines is appropriate to support implementation of monetary policy in the longer run. Indeed, the FOMC has indicated that in the longer run, it will hold no more securities than necessary to implement monetary policy efficiently and effectively, and that it will hold primarily Treasury securities. The ECB has also used unconventional measures to provide accommodation, but unlike the Federal Reserve, BoJ, and BoE, this has primarily been through liquidity provided directly to the banking system via longer-term refinancing operations, rather than through asset purchases. This liquidity was provided at fixed terms of up to three years, thus allowing the size of the ECB’s balance sheet to normalize automatically as refinancing agreements mature. By contrast, the ECB’s upcoming purchases of asset-backed securities and covered bonds will present it with longer-term portfolio considerations. Finally, I should note that central banks—like other financial market participants—need to remain aware of changes in the financial market landscapes in which they operate. They may need to adapt their operations accordingly as they move away from asset purchases and back to money market instruments to implement monetary policy. For example, in addition to reflecting developments in its balance sheet since the financial crisis, the FOMC’s approach to normalizing policy also reflects changes in U.S. money market dynamics that have been influenced by various factors. These factors include the extraordinary level of liquidity that’s been provided, access to IOER that is limited to depository institutions, and a number of international and domestic regulatory reforms. International regulatory reforms include the liquidity coverage ratio, leverage ratio, and net stable funding ratio. In the U.S., changes in deposit insurance premium calculations, rules governing money market mutual funds, and the potential for a capital surcharge based in part on short-term wholesale funding may also affect certain market participants. Many of the changes in regulation—along with changes in market structure, technology, and other factors—may affect market participants’ activity and relationships in money markets. On net, their balance sheet costs may be higher, which may prompt money market participants to require higher returns to engage in competition to arbitrage wedges in money market rates and to alter their participation in central bank operations and facilities. This outcome may affect the transmission of monetary policy or require central banks to adapt their operations to accommodate these realities. In conclusion, I’d like to note that the framework for implementing monetary policy and the landscape in which we operate have seen important changes in the years since the crisis, and they continue to evolve. The Desk plays an important role in this process, carrying out open market operations at the direction of the FOMC, in pursuit of the operating objectives the FOMC deems appropriate to achieve its dual mandate of maximum employment and price stability. The operating tools that the Federal Reserve has developed will allow us to tighten monetary policy when the FOMC determines it is appropriate to do so, but I have no doubt that we will continue to learn more about how these tools interact as we normalize policy and make adjustments over time, just as we have done in the past. We will also learn from and share our experiences with other central banks that are undergoing similar transitions. 1 I would like to thank Deborah Leonard and Matthew Raskin for their excellent assistance in the preparation of these remarks and colleagues in the Federal Reserve System for numerous insightful comments and suggestions. 2 The Board of Governors is also responsible for the supervision and regulation of banks and systemically important financial institutions, payments systems and infrastructure, and overall oversight of the Federal Reserve System. It may also authorize Federal Reserve Banks to extend credit to other entities under emergency lending authority. 3 The FOMC’s Authorization for Domestic Open Market Operations and Authorization for Foreign Currency Operations outline the activities that the selected Bank is eligible to undertake. The domestic policy directive and foreign currency directive specifically instruct the Desk to execute such operations in furtherance of a particular operating objective defined by the FOMC. 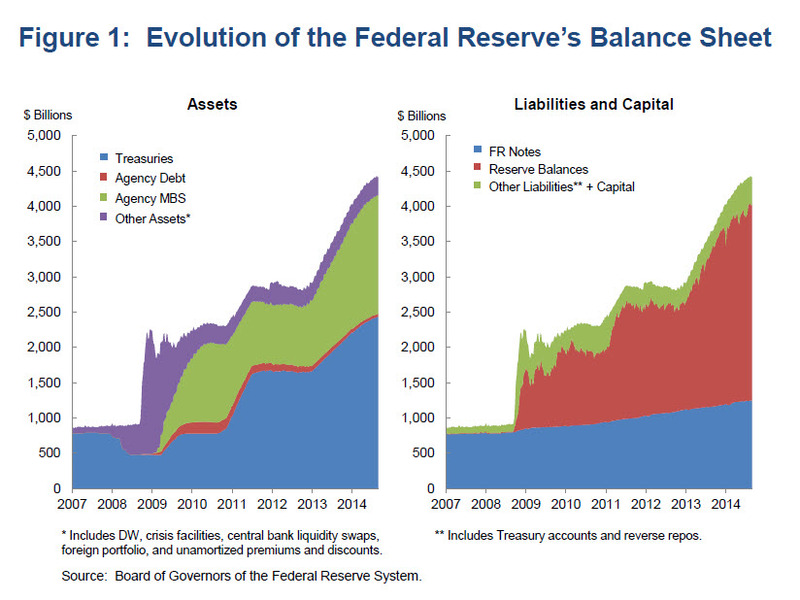 4 In the five years prior to the crisis, total reserve balances averaged $20 billion and excess reserves—balances in excess of those required to satisfy reserve balance requirements —averaged about $1.5 billion. 5 These asset purchases followed various programs the Fed initiated during the crisis to support the liquidity of financial institutions and foster improved conditions in financial markets. Credit extension through these crisis-related programs was temporary in nature, so the impact of these programs on reserve balances was unwound as the loans were repaid. In contrast, reserve expansion associated with LSAPs has a more enduring effect as long as the assets remain in the SOMA portfolio, subject to offsetting influences on reserves from changes in other balance sheet items. 6 The authority for the Federal Reserve to pay interest on reserve balances held by depository institutions was granted by Congress prior to the crisis, in the Financial Services Regulatory Relief Act of 2006, with a planned effective date of October 2011. However, implementation was accelerated as part of the response to the financial crisis. The statute authorizes Federal Reserve Banks to pay interest on balances maintained to satisfy reserve balance requirements (required reserves) and on excess balances (excess reserves). 7 As noted earlier, the Board of Governors is responsible for setting the rate of interest on reserves. Since December 16, 2008, the interest rates on required reserve balances and excess reserve balances have both been ¼ percent, but the rates need not be the same. Although the interest rate on reserves represents an overnight rate, it is calculated and paid out on a lagged basis according to two-week reserves management maintenance periods. The payment is based on daily account balances and a weighted average of applicable overnight rates over the maintenance period. More information can be found in Regulation D.
8 The MEP provided additional monetary policy accommodation by increasing the duration of the SOMA portfolio, but unlike LSAP programs, on net it had a neutral effect on the level of reserves. 9 From mid-August 2010 through September 2011, principal payments from holdings of agency debt and agency MBS were reinvested in longer-term Treasury securities. Since October 2011, they have been reinvested in agency MBS. 10 Ben S. Bernanke, “The Crisis and the Policy Response,” Stamp Lecture, London School of Economics, London, England, January 13, 2009. 11 A security’s duration captures the weighted average term to maturity of the security’s cash flows and provides a measure of the sensitivity of the security’s price to changes in interest rates. Duration (and therefore price risk) is generally greater for longer-maturity and lower-coupon securities. Agency MBS prices additionally carry prepayment risk, the risk associated with the uncertainty around the timing of principal cash flows owing to the fact that homeowners have the option to prepay their mortgages at any time. Because of this embedded option, agency MBS cash flows vary as interest rates change. 12 A reverse repurchase agreement (reverse repo, or RRP) is a type of temporary OMO in which the Desk sells a security from the SOMA portfolio to an eligible counterparty with an agreement to repurchase that security at a specified price at a specific time in the future. It is economically equivalent to a collateralized investment with the Fed in which the difference between the sale price and the repurchase price, adjusted for the time between transaction legs, implies a rate of interest paid by the Fed on the cash invested by the counterparty. 13 For more details about ON RRP operations, please see FAQs on the New York Fed’s website.